Major cities: Capital: Abu Dhabi; Dubai. Nationality: Noun and adjective — U.A.E., Emirati. Education: Years compulsory: ages 6-12. Literacy — 90% for Emirati citizens. Health: Life expectancy: 78.3 yrs. Work force (2008, World Bank): Total: 2.8 million. Agriculture — 5%; industry — 60%; services — 35% (rounded). Female participation rate — 41.8%. Branches: Executive: 7-member Supreme Council of Rulers (comprising the hereditary rulers of each Emirate), which elects president and vice president; prime minister is selected by president. Legislative — 40-member Federal National Council (consultative only). Judicial — Islamic and secular courts. Trade (2006 est. ): Exports: $157 billion: petroleum, gas, and petroleum products. Major markets — Japan, South Korea, Thailand, India. Imports — $126.6 billion: machinery, chemicals, food. Major suppliers — Western Europe, Japan, U.S., China, India. Of the total 8.9 million residents, less than 15% are Emirati, more than one-third are South Asian, and a significant number are from Europe and North Africa. In 1968, the U.K. announced its decision to end the treaty relationships with the seven Trucial Sheikhdoms which had been, together with Bahrain and Qatar, under British protection. The nine attempted to form a union of Arab emirates, but by mid-1971 they were unable to agree on terms of union. 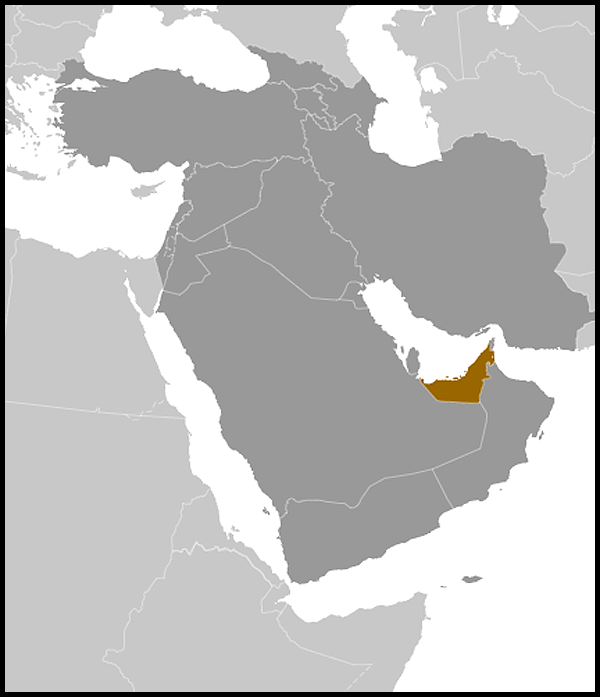 Bahrain became independent in August and Qatar in September, 1971. When the British-Trucial Sheikhdoms treaty expired on December 1, 1971, they became fully independent. On December 2, 1971, six of them entered into a union called the United Arab Emirates. The seventh, Ras al-Khaimah, joined in early 1972. Abu Dhabi's ruler, Sheikh Zayed bin Sultan al Nahyan was elected by the Supreme Council as President and Dubai's ruler, Sheikh Rashid bin Said al Maktoum, became Prime Minister. The U.A.E. has no political parties. The rulers hold power on the basis of their dynastic position and their legitimacy in a system of tribal consensus. Rapid modernization, enormous strides in education, and the influx of a large foreign population have changed the face of the society. In December 2006, the U.A.E. held its first-ever limited elections to select half the members of the FNC. Ballots were cast by electors selected by the ruler of each emirate. One woman was elected to the FNC and additional women were appointed to be council members. In September 2011, the U.A.E. 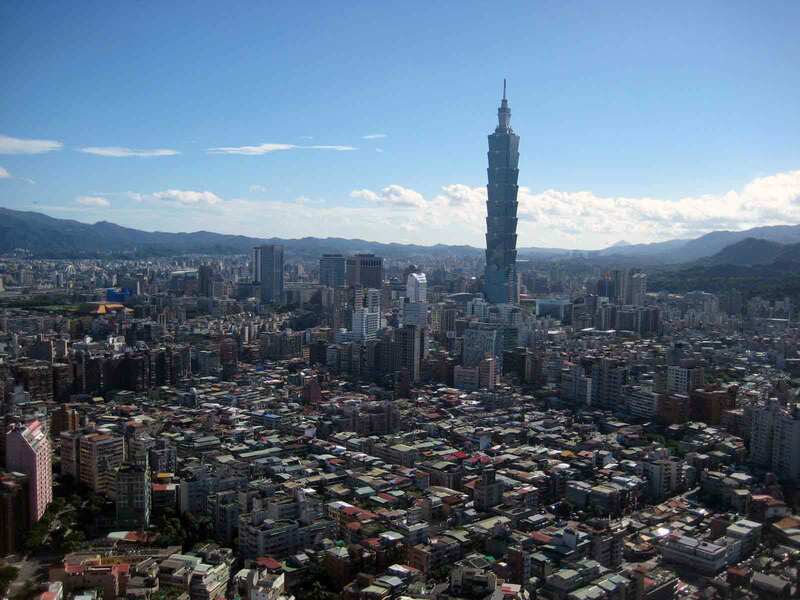 held its second FNC elections, this time expanding the electoral pool from under 7,000 in 2006 to nearly 130,000 voters. Again, one woman was elected; an additional six were later appointed. The Trucial Oman Scouts, long the symbol of public order on the coast and commanded by British officers, were turned over to the U.A.E. as its defense forces in 1971. The U.A.E. 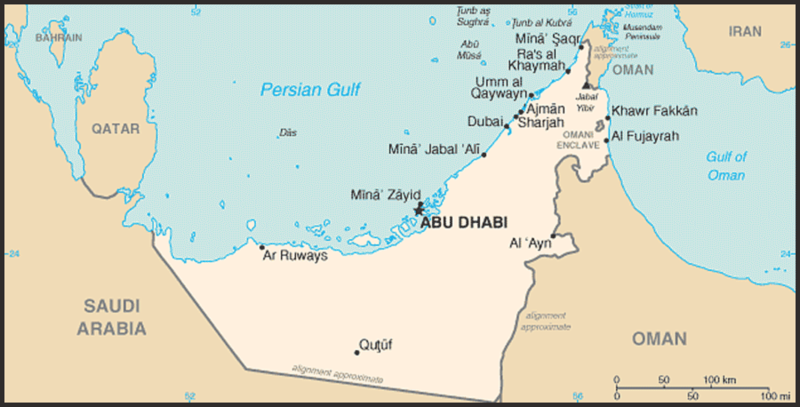 Armed Forces, consisting of 64,000, are headquartered in Abu Dhabi and are primarily responsible for the defense of the seven emirates. Although small in number, the U.A.E. armed forces are equipped with some of the most modern weapon systems, purchased from a variety of countries. In 2010 and 2011, the U.A.E. was one of the largest foreign buyers of U.S. defense equipment with a portfolio value of $14B The military has been reducing the number of foreign nationals in its ranks, and its officer corps is composed almost entirely of U.A.E. nationals. The U.A.E. air force has about 4,000 personnel. The Air Force has advanced U.S. F-16 BLOCK 60 multirole fighter aircraft. Other equipment includes French Mirage 2000-9 fighters, British Hawk trainer aircraft, 36 transport aircraft and U.S. Apache and Black Hawk helicopters. In 2011, the UAE Air Force participated in Operation Unified Protector in Libya, conducting air-to-air and air-to-ground operations. The U.A.E. Navy is small — about 2,500 personnel — and maintains 12 well-equipped coastal patrol boats and 8 missile boats. Although primarily concerned with coastal defense, the Navy is constructing a six-unit class of blue water corvettes in conjunction with French shipbuilder CMN. The U.A.E. 's Land Forces are equipped with several hundred French LeClerc tanks and a similar number of Russian BMP-3 armored fighting vehicles. In early 2010, the Presidential Guard (PG) was formed. The PG is comprised of Marines, Reconnaissance, Aviation, Special Forces/Amiri Guard and Mechanized Brigades. PG personnel are conducting operations in Afghanistan (the only Arab personnel undertaking full-scale operations in the country). The U.A.E. contributes to the continued security and stability of the Gulf and the Strait of Hormuz. It is a leading partner in U.S. counterterrorism efforts, providing assistance in the military, diplomatic, and financial arenas since September 11, 2001. The U..A.E. also contributes to international counterpiracy efforts. It hosted a counterpiracy conference in Spring 2011 — the first such conference co-hosted by a foreign government and private industry, which also (as another first in the case of private industry) succeeded in raising donations to be put towards the UN Trust Fund. The U.A.E. continues to look for ways to improve its efforts. It will reportedly host another counterpiracy conference in 2012. The U.A.E. also will host the Spring 2012 plenary meeting of the UN Contact on Piracy Off the Coast of Somalia. Also on the piracy front, two U.A.E. vessels were pirated in 2011. Most notable was the M/V Arrilah, which the U.A.E. military successfully retook. Major increases in imports have occurred in manufactured goods, machinery, and transportation equipment, which together have accounted for 70% of total imports. Another important foreign exchange earner, the Abu Dhabi Investment Authority — which controls the investments of Abu Dhabi, the wealthiest emirate — manages an estimated $600 billion in overseas investments. The United States has enjoyed friendly relations with the U.A.E. since 1971. Private commercial ties, especially in petroleum (the U.A.E. is the only GCC state to allow private-sector participation in its oil and gas sector), have developed into friendly government-to-government ties, which include security cooperation. The U.A.E. is the United States' single largest export market in the Middle East and North Africa region, with $14.4 billion in exports in 2008 and more than 750 U.S. firms operating locally. There are nearly 50 weekly non-stop flights to the U.A.E. from six U.S. cities. U.A.E. ports host more U.S. Navy ships than any port outside the U.S. The United States was the third country to establish formal diplomatic relations with the U.A.E. and has had an ambassador resident in the U.A.E. since 1974. U.S. Embassy mailing address: PO Box 4009, Abu Dhabi; tel: (971) (2) 414-2200. Consulate General Dubai: PO Box 121777; tel: (971) (4) 309-4000.